"I have led you, my Prometheans, for thousands of years, and I shall continue to lead you. Rise! Rise, and protect the Forerunners! Rise, and protect the galaxy!" Promethean Knights are a class of mechanized Forerunner Promethean warriors created by the Ur-Didact toward the end of the Forerunner-Flood war to combat the Flood. 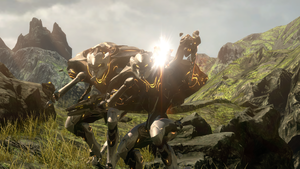 After the Librarian exiled the Ur-Didact on Requiem, several legions of these constructs stationed on the shield world went dormant for the next 100,000 years. The machines—as well as their master—were reawakened in late 2557, when John-117 and the UNSC stumbled upon Requiem. By 2558, they, along several other Promethean constructs, had fallen under control of the Created, led by Cortana, who believed the artificial intelligences were the rightful heirs of the Mantle of Responsibility, not humanity. The Promethean Knights are bipedal, fully weaponized mechanical warriors designed to operate and eliminate threats in a wide variety of environments. While the Knights are fully machines, their AI is a result of organic minds transformed into software format via a device called the Composer, unlike the Crawlers or the sentinels which are completely artificial in origin. This extreme measure was intended by the Ur-Didact to create an unstoppable army, completely immune to Flood infection, near the end of the Forerunner-Flood war. The Didact's Promethean Warrior-Servants were the first Knights, but these were too few in number to turn the tide. Desperate for greater numbers and still refusing to accept the Halo Array as a final option, the Didact "conscripted" a large population of humans from Omega Halo to expand his army; this genocidal act was the ultimate reason the Librarian imprisoned her husband. Despite housing harvested human and Forerunner essences, the original personalities are no longer in evidence; the Knights are intelligent, but viciously ruthless in behavior and seemingly lacking any form of free will. A Knight's rank is based on a combination of past military service and "popularity amongst their peer group". Even composed children were converted into Promethean Knights. Knights carry a single Promethean Watcher sentinel in the back of their armored carapace, which can be deployed at will for combat support. The Watcher's AI is a low-level ancilla split off from the Knight's essence when the Watcher is deployed. The Watcher can greatly improve the Knight's combat capabilities by raising hardlight shields, reviving fallen Knights, summoning Crawlers, building automated turrets, and flinging back enemy grenades while distracting them with its own weaponry. A Knight launches a pulse grenade. Promethean Knights utilize a broad arsenal of weapons. For close-quarters combat, they are armed with a hardlight blade on one hand. Each class of Knight has a uniquely shaped blade, totaling six variations amongst them. They also use various Forerunner ranged weapons, such as Scattershots, Suppressors, LightRifles, Binary Rifles, and Incineration Cannons; their dedicated armament largely depends on their class and role. They frequently employ pulse grenades in combat, generating it from the arm-blade's joint. Some subtypes also make use of autosentries, in addition to the support that they can already summon. Knights are remarkably agile, and in addition to using their limbs for conventional movement they are also capable of translocating over moderate distances, allowing them to either swiftly retreat from the battlefield or to flank their enemies. Although not commonly seen in the field, Knights can also be deployed from warships and are equipped with thruster engines on the sides of their carapace for maneuvering. This capability was used near the end of the Forerunner-Flood war, when Knights were deployed to board and destroy Flood-controlled ships from within. Upon taking critical damage, Knights completely disintegrate, a process that Cortana described as a "data purge." Their bodies erode away from where the fatal shot was received and dissolve into glowing particles. After disintegration, a small ball of swirling light is left behind for a brief period; a Promethean Watcher can use this remnant to recreate and revive the Knight; however, an individual Knight can only be revived in this manner only once. If a Knight is destroyed, revived, and then destroyed again, the Knight's body disintegrates completely, leaving nothing behind. When a Knight is destroyed, it drops a weapon; after revival, it wields a weapon of the same type even if the first weapon was picked up. Similar to the other Promethean constructs, as well as some earlier types of Forerunner military automatons, Knights have a number of insectoid attributes; they produce noticeably insect-like clicking sounds and tend to make spasmodic movements, especially when idle. Additionally, their carapace resembles that of an insect and possesses hatches resembling insect wings which frequently twitch and flutter seemingly at random; located on the "wings" are the Knight's anterior shield distributors. Knights have two sets of arms; two large, artificial arms at each shoulder in which the weapons are mounted and two smaller arms below the shoulders. The larger arms are composed of separate segments held in formation through an energy field. Knights also have a comparatively smaller set with small, five-fingered hands. These smaller arms are more "organic" in shape and are physically attached to the Knight's body. Their main locomotion is provided by a pair of extremely powerful legs designed for agility and speed. Broad-set stabilizers support the large body and reinforced joints offer fluid movement despite the Knight's size and mass. At the back of their feet there is a counter-locking system for tactile balance. Knights are covered in patterns of light and have a fire-like glow around their heads. The color of this light usually indicates their allegiance. Those with blue lights are controlled or otherwise loyal to the Librarian or her remnant; upon the Didact's release from his Cryptum the Knights' color changed to orange, indicating they had returned to his control. The head features an armored helmet with glowing eyes and what appear to be grimacing jaws with rows of teeth. This helmet assembly can be retracted in two sections, revealing a glowing humanoid skull underneath. Cortana initially theorized that this is because the Prometheans have mimetic capabilities, and had based the skull on scans taken of the Master Chief, though the skull may in fact be based on that of a Forerunner. Knight Lancer - a variant equipped with long-range weaponry, greater mobility and enhanced tracking capabilities. Knight Battlewagon - heavily armored variant. Knight Commander - command-and-control unit for Knight forces. Promethean Knights are "voiced" by Tasmanian devils. 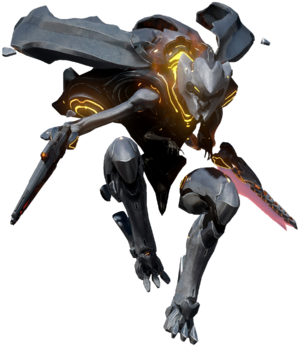 Promethean's small manipulator hands are connected to their bodies, but their weapon arms and legs float free of their body. The legs (as opposed to some form of anti-gravity device) nevertheless seem to support their weight because the body sways and moves in response to the Prometheans' heavy footsteps. The Knight's helmet closely resembles that of a hornless FOTUS helmet. If a Knight boards a vehicle, it can only melee. Early concept art of the Knight for Halo 4, showing a much more mechanical design. Early concepts focusing on the Knight's design. Early concept art of the Promethean Knights, showing a much more recognizably human design. Concept art comparing a Knight to a Spartan-IV. Concept art of the Master Chief fighting a Promethean Knight in close-quarters. Concept art of Cortana bringing up a hologram of a Promethean Knight. Different variations of Promethean Knights. A hologram of a Promethean Knight being analyzed by members of the UNSC Infinity. In-game closeup of a Promethean Knight's hard-light blade. Detailed closeup of a Promethean Knight's hard-light blade. Alternate preview of a standard Knight. A Knight dispatches a Sangheili Commander. A Knight preparing to engage hostiles. A blue Knight revealing its skull. An orange Knight revealing its skull. A Spartan-IV engaging a Knight in close quarters. A Knight, supported by a Watcher, engages a Spartan-IV. An animated image of a Knight Lancer translocating. A Closeup of a Promethean Knight in the terminals of Halo 4. Poster detailing the 4 variants of the Promethean Knights seen in Halo 4. Promethean Knights attack Blue Team on Installation 03 in 2557 in Halo: Escalation. A Promethean Knight kicking one of Sali 'Nyon's Sangheili Zealots during the Battle of Aktis IV in 2558. Concept of modified Promethean Knights for Halo 5: Guardians. Cut designs of Knights for Halo 5: Guardians. Knight Marshal in Halo 5: Guardians. Knight Strategos on Escape from ARC. Red team faces off against Strategos in Warzone. A Knight with its carapace blown off facing a Spartan-IV. The "face" of a Knight in Halo 5: Guardians. A captured Knight bangs the walls of its cell on Genesis, seemingly depressed. The same Knight cradling its head in its arms. Promethean Knights engaging Blue Team on Installation 03 in Halo Mythos. Concept art of Promethean Knights attacking Red Team for Halo Wars 2.